It’s funny to think that we’ve never reviewed Cultivate here on Pojo. It’s been a staple of constructed basically every time it was in a Standard set, and it is likely to be a staple of casual Magic and Commander forever. It’s very easy to overlook a card as simple and elegant as this one, but it’s a lot more powerful than it reads at first glance. You can’t use the lands for mana right away like with Sol Ring, but getting to cast it makes your deck so much more consistent from the third to the fifth turn that it can put you basically out of sight. Cultivate is, of course, also the non-subtyped version of Kodama’s Reach from Champions of Kamigawa. It’s even crazier to think that Kamigawa’s first release was fourteen years ago. Champions of Kamigawa is now longer ago than Alpha was when Champions of Kamigawa was released. While Cultivate itself has not been reviewed before, a card very similar to it did get a review: Kodama’s Reach from Champions of Kamigawa, which is almost exactly Cultivate, word for word! Minus the Arcane subtype, but who cares. 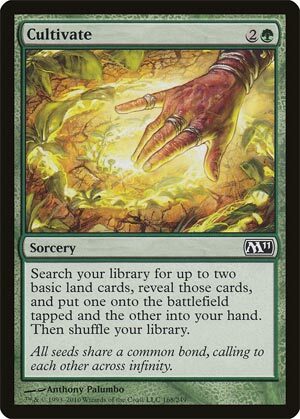 Cultivate has been a casual and Commander staple for years, correcting mana for a flexible cost. The downside is that it’s merely okay in Standard when it comes around; you’re going from three mana to five mana on turn 4, and the more impactful jumps are from one to three or two to four. This is not to say that it’s unwelcome, as being able to accelerate your gameplan is a solid plan indeed…and green can go large. But cheaper ramp spells tend to be more strongly preferred (like Rampant Growth, Sakura-Tribe Elder, and Farseek), as the timing on Cultivate can be awkward. Casual star, but keep it away from Modern!